The Medfield High School Theatre Society presented the thought-provoking and lyrical musical, “Big Fish,” from March 15–17 at the school’s Lowell Mason Auditorium. The students’ subtle, emotional acting and heartfelt singing enthralled the audience, while teaching valuable lessons about family legends and legacies. 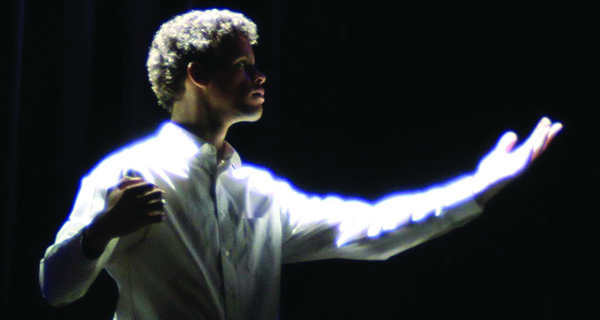 The play centers around the relationship of Edward Bloom and his son, Will. Edward is fond of telling fantastic tales of his youth that are populated with witches and circus performers, as well as stories of high school exploits and army adventures. Will doesn’t understand why his father tells all these fantastic stories, and he longs to know the real man behind them. As the story develops, Will gradually grasps the meaning of these stories in his father’s life, and that he will also tell them to carry on the family legacy. The Medfield production’s set featured a revolving piece on stage left that showed the front of the Bloom home on one side and a bedroom on the other side. At the back of the stage, a dock suggested the river beyond. The middle curtain concealed these two set pieces when necessary. The open area from the center to stage right was used for the dramatization of Edward’s tales, as Will and his wife Josephine, played by Lily McCormick, stood to the side, observing the action and trying to make sense of it. Medfield High School showcased two outstanding male singer-actors in this musical. Michael Koellner, as the exuberant Edward Bloom, used his expressive, powerful voice and honest acting skill to illuminate Edward’s stories and memories. Matthew McGrory, as questioning son Will Bloom, expressed frustration with his father with raw and emotionally-delivered, riveting songs. Notable performances were given by Zoey Pollard, as the mysterious Witch, Max Norton as the distinguished Mayor of Ashton, Aidan Redding, as the villainous Red Fang, and Michael O’Leary, as the giant Karl, who even danced while on stilts. 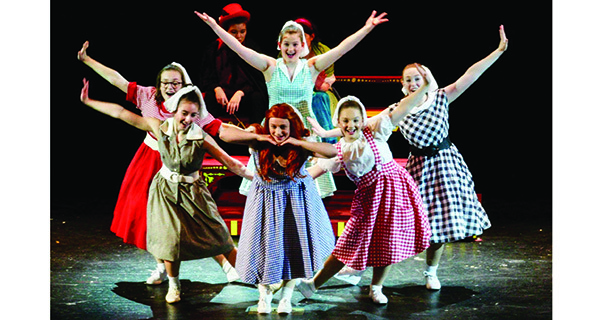 Kathleen Mulready, as Sandra Templeton, and the Alabama Lambs, comprised of Kate Davignon, Nicole Mulready, Jess Nicoterra, Assesandra Kelley and Olivia Price, delighted the audience with the sweet and nicely choreographed “Little Lamb from Alabama.” Mulready and Koellner then joyfully shared the love of Edward and Sandra in Daffodils, as the backdrop became a glorious field of daffodils. The Alabama Lambs. From left to right: Olivia Price, Jess Nicotera, Kathleen Mulready, Alessandra Kelley, Nicole Mulready, Kate Davignon. The ensemble enlivened Edward’s tales with exuberance, versatility, and skill as Wedding Attendants, Ashton Townfolk, Cheerleaders, Circus Folks, USO Performers, the Witches Coven, and Auburn University Students. Everyone involved in the production of Big Fish deserves congratulations for making a success of this subtle musical, which featured emotion, growth, and understanding over flashy song and dance routines, and left the audience enriched and satisfied.